David Ryan is an experienced PR and Marketing specialist, working within the hospitality and travel industry for over 20 years. He’s worked with the likes of worldwide hotel brands Accor, Hilton and Best Western Hotels, plus many smaller independent, boutique properties in the UK and Europe. I was excited to get the chance to put my questions to David as it’s evident that the PR efforts that a hotel is able to invest will clearly have a beneficial impact on a hotels overall direct bookings – which is something it seems we’re all striving towards! #1 – To give a brief summary of your role as a PR/Marketing specialist for hotels, I’d be interested to know in which way are you able to help hotels/hotel groups, and through what kind of methods do you tend to work? Is it mainly about “putting out fires” – I’m guessing it’s a bit more constructive than that? My background since graduation in 2001 has been within the hotel and hospitality industry working within sales, marketing, revenue management & general management. 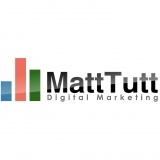 I offer hotels and hospitality businesses both advice and help on marketing – i.e. what is working for them, what isn’t and recommendations on best practices. On the PR side since setting up on my own, I work with hotels to help them both position their property and raise their profile through the use of public relations. It’s about 90% positive and maybe maximum 10% ‘putting out fires’ but even then the ‘putting out fires’ is usually minor. I help hotels/hotel groups get access to travel journalists and the media through my own contacts, built up over 16 years experience. I also briefly diversified into the design/architecture industry – which has also helped me enormously meeting new journalists and media contacts from this industry, which often has some cross over into travel too. #2 – For your typical independent hotel, what kind of events or news are worthy of something like a Press Release? Obviously there’s lots taking place within a hotel as they fulfil a space within a community – from your experience what type of news tends to get the most beneficial coverage – could it be something as simple as a rebrand/hotel renovation? This is something I have plenty experience of! I’ve had many discussions with hotel owners, GM’s etc about this. Yes, a simple rebrand or hotel renovation can and should be used as a hook in a press release – but it’s important to remember that they tend not to be extensively covered as it’s really not that newsworthy. If a hotel has refurbished a space, I always advise them to add a new angle to it – for example, if an exhibition space has been refurbished, they should organise a launch party and invite all the event bookers, and travel journalists. #3 – Continuing from the above – have you ever had to advise a hotel against creating a Press Release, as it’s wasn’t likely to gain them much traction? Or is there nearly always a way of creating a newsworthy story/event? As I mentioned above, it’s often a case of preparing the press release anyway or trying to persuade them against issuing one but do an update, either on their own website as a blog post or social media channels as ‘update’. It’s really no different only it’s not being sent to my contacts of journalists. Unless there is a very interesting hook, I would not send a release to my contacts on something that is unlikely to get much traction or coverage. It’s always a challenge managing owners/GM’s expectations in this area, but at the same time, journalists are very busy people and I will not jeopardize my relationship with them by sending them releases that are of no interest. #4 – There’s been a big rise in the number of journalists and media specialists making use of social media, Twitter especially, to seek information for their publications. The HARO newsletter service is another similar example. Should hoteliers (or their digital agencies) start keeping a closer eye on these for relevant outreach opportunities, or did you have any other advice for gaining coverage on a shoestring-budget? YES! I check my HARO update twice a day. I advise hotels to start their own research on travel/hotel journalists and publications and keep their contact details somewhere – even today in 2019, I still use Excel as my main contact list. Many journalists covering our industry use twitter and I’ve had more successes from reaching out initially on twitter than sending them emails. It’s a long, continuing slog both updating your contact list and constantly seeking out new journalists covering this industry, but it’s all relationship building and the rewards are fruitful. #5 – For a hotel to grow its direct website traffic and revenue, getting featured in the press is one of the fastest ways to see growth – whether it’s from referral traffic from an online article, or a rise in branded web searches as a result of this exposure. How hard is it for a hotel to get featured in the likes of a Telegraph or Daily Mail piece? Or is it best to aim low and start with local news outlets? Aim low and start with the local news, niche websites. For many hotels, getting coverage in national publications such as Telegraph or The Times is nigh on impossible – unless the story is of national interest. But by building up a solid base of coverage on local news and niche industry sites, with lower traffic, then they will eventually get noticed by publications with national/international reach. Start small, build up a foundation of journalists and media contacts that you know and have a good relationship with……..bigger results will happen. #6 – If you’re happy to share this, what would you say has been your biggest success to date in terms of press coverage for a client – and why do you think it worked so well? I can’t go into too much detail, both for confidentiality reasons and I have to feel like bragging, but I managed to get a feature interview and front cover mention with a hotel designer in Frame Magazine. I think the reason it happened was because the hotel designer was using an innovative approach, and materials, to product design (they were designing products for a brand new hotel in London). On the OTA side, I wish hotels would be more proactive and dare I say it aggressive when both working with OTA’s and attracting direct bookings. I write regularly on my site and LinkedIn about how hotels should work with OTA’s. I’m not against OTA’s, but I believe hotels need to take a much harder line, both fighting for their own right to control rate and reducing inventor that they hand over. I’m elaborated more below, on #8 about how hotels should use TripAdvisor to increase their rank/position. #8 – Looking at hotel reputation management, what’s the best way a hotel can deal with a prominent negative review on the likes of TripAdvisor? I’ve often seen 1 star reviews shown as very visible organic search results when carrying out a branded hotel search (first 5 results in Google). Is there any way a hotel can try to bury this type of coverage? No! It’s never advisable for hotels to try to bury any type of coverage. 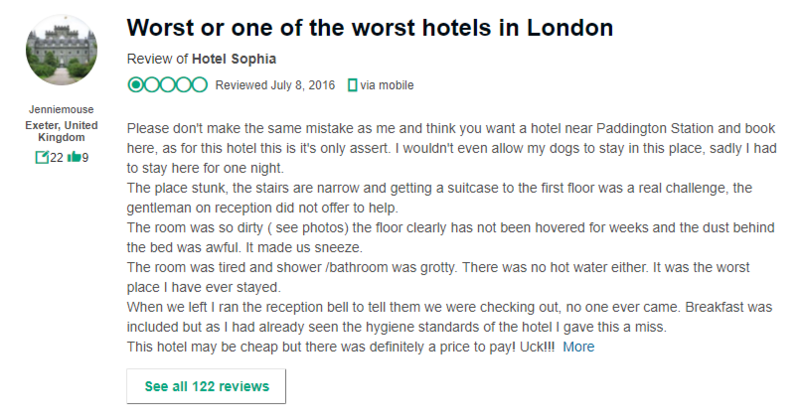 Most travellers are aware when looking at hotel reviews on TripAdvisor that there will be negative reviews – in fact if there aren’t any, then I get suspicious! All hotels will have had guests that no matter what, will complain or write a bad review. I always advise hotels that as long as negative, or 1 star reviews, do not total more than 3-4% of all reviews, then it’s ok. Also, it’s important to look at the consistently of negative reviews – there may be a theme/trend, which is something I advise hotels about. #9 – Following on from that, I’ve often seen that when searching for a hotel within Google, the auto-complete feature suggests I search for “hotel name bed bugs”. Obviously this is a bit of a nightmare for that hotel even if it was a very old problem, or perhaps a vicious rumour. Is there anything the hotel could do about this kind of auto-suggested search? I’ve seen hotels engaging in campaigns in a bid to create additional, more positive auto-suggested searches (like hosting an event on their property). Could something like this work in your opinion? Yes, definitely. Like i said above, trying to ‘bury’ bad news or make them disappear is the worst thing ever. IT’s best to be open, honest and transparent. If a hotel has had issues with bed bugs, food poisoning etc, then I also advise them to try new campaigns, as you suggested hosting an event, or carrying out a refurbishment, new furniture, etc. #10 – You’ve been vocal recently about the need for hotels (and OTA’s) to be more focused on personalisation during the buyers journey. 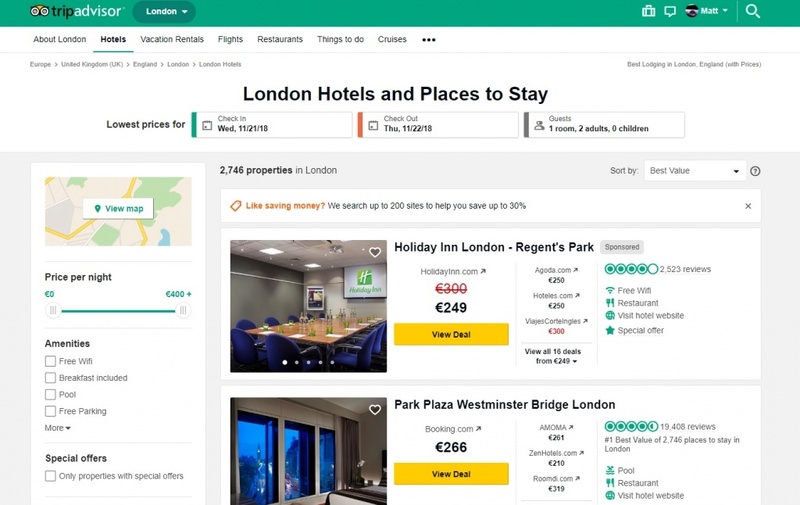 What kind of thing do you think boutique/independent hotels could look at doing to improve this – is it as simple as having different website content based on the users geographic location? Or showing them different content based on where they likely are in the booking funnel? For boutique, smaller independent hotels, they sometimes lack the resources to be able to offer different website content based on location and visitors. For them, they need to get to know their hotel and guests – why are they coming? Where are they coming from? How are they booking? Direct or agent? Why? Boutique, independent hotels have the advantage of being more nimble and able to actually call guests – have a conversation on the phone, find out more about them. Then you can use that information to ensure that your website is up to date with content relevant to them and you are advertising or using the channels that they used to book. #11 – Traditionally, PR coverage has meant getting featured offline – in TV shows, newspaper articles, or even radio shows. This has always been pretty tricky to calculate an exact ROI on – obviously a positive appearance for a hotel on a Travel show on TV viewed by millions is likely to have an impact on their revenue (online and offline), it’s just hard to give an exact return on. This is especially true when compared to digital PR where online coverage can be measured quite precisely. Do you think this is still the case – and are there any ways in which you can calculate the return from getting a hotel offline coverage? Offline PR, for smaller boutique hotels can actually be relatively easier to manage the ROI. Hotels need to be asking every guests “how did you hear about us?” if it’s their first time. I know this can be seem difficult to ask every guest, but as I said above, these hotels have the potential to be more nimble and entrepreneurial to actually ask the guests this. It’s also important to know that building a profile takes time and hotels need to understand that offline coverage, while may be difficult to calculate an exact ROI, it should be viewed in the medium and long term – it’s a long term game and takes time to build a profile and brand. Online coverage can be measured very quickly and precisely, but like offline, it needs consistent work across the long term for a long term ROI / business growth. #12 – Outside of helping hotels with their PR and marketing efforts, what else are you passionate about? What do you do to switch off from work? I never switch off! I’m also a full time dad to a 11 month old son, so that keeps me and my partner very busy! I split my time between the UK and Israel (am British married to an Israeli). In Israel, I’m a co-founder of a support group to help new immigrants settle into the country, make friends, find jobs, learn Hebrew and generally support them in their new country. I’m a massive people-person and enjoy helping people be the best they can be – without sounding fuzzy but helping people overcome challenges gives me a warm feeling inside. 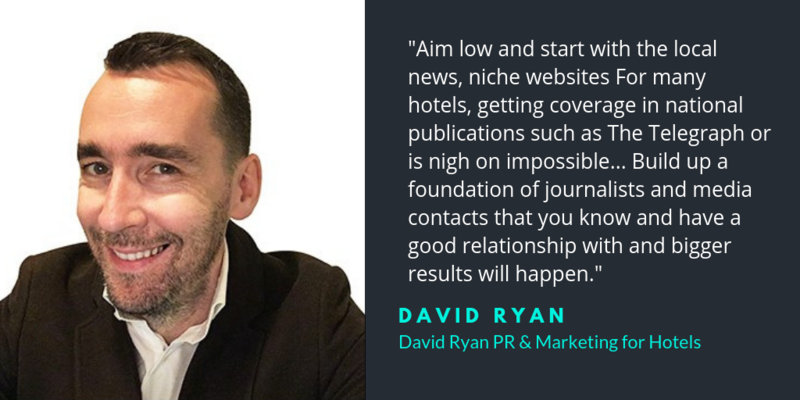 Thanks again to David Ryan for taking the time out to answer my often-rambling questions about carrying out PR for hotels. Got any follow-up questions you’d like to put to either myself or David? Anything you don’t agree with, or weren’t clear on? Leave a comment below, or you can also direct them on Twitter to David or myself. Want to take a look at other interviews with leading professionals working in the search industry for hotels and travel? Just take a look at the Search Marketing for Hotels section.